Learning and growing is what we will be doing at the League of American Orchestras Conference to be held in St. Louis, June 17-20, 2013. Those who share a passion for symphonic music - volunteers, musicians, staffs, and boards - search with open minds for ways to secure this classical art form for future generations. The Conference theme is Imagining 2023. How do we see our symphonies in 2023 and what will we need to do to achieve our goals? Our volunteers play an important role as they advocate for our great orchestras, participate in fundraising, and populate the symphony halls. In these crucial times for our orchestras, it is important to have volunteers who are knowledgeable and prepared for future challenges. Leave with a renewed dedication and a magnificent obsession for the success of your orchestra. 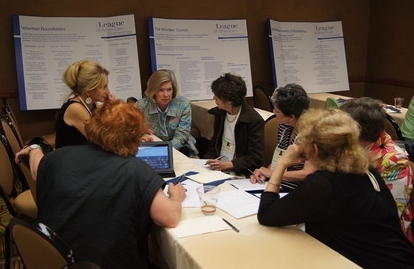 Your Volunteer Council is actively planning an informative and productive program at the League’s 2013 Conference in St. Louis. Volunteer sessions are June 17 - June 20, beginning with a riveting panel, an interactive session, and with a special Dine-Around treat. Begin making plans now to attend and learn first-hand from the best of the best! The League has stressed to its member orchestras that to be successful they need to focus on best practices for reaching diverse audiences, sustainability, and good governance. Volunteers play a key role in supporting their orchestras as they strive for success. With this in mind, our volunteer sessions for the 2013 Conference will highlight diversity and community linkages, governance, and sustainability by expanding our award-winning Gold Book presentations to include Question & Answer sessions; having a League-selected speaker at our networking luncheon; and having a panel on four very successful and diverse orchestra and volunteer programs. All sessions will be interactive with plenty of time for Questions & Answers and networking opportunities. Attending Conference is a great way to connect with orchestra volunteers from across the country, get answers to questions, and learn about other volunteer organizations’ best practices for achieving their goals. We hope to see you in St. Louis for the 2013 League Conference! Conference registration and program details will be available online this month at americanorchestras.org. The Marshall Symphony Orchestra (MSO) is in its 7th year of hosting Jeans ‘n Classics, and the concert/event continues to be a success. In 2006, Tiffany Ammerman attended a Texas Association for Symphony Orchestra Conference in Midland, Texas. During the conference, the symphony performance was held at the Texas Commemorative Air Force Museum and as she watched and was impressed by the various ages in the crowd along with the unusual venue, a vision for Marshall, Texas came to her. 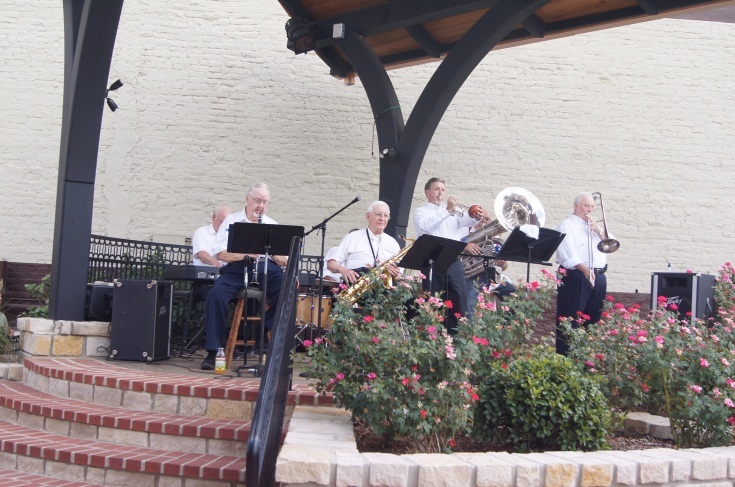 Marshall was in the process of revitalizing its downtown and the vision was to promote Marshall, bring people downtown, have an outdoor concert, and build audiences for the symphony. After approaching Maestro Leonard Kacenjar and the board of directors concerning thoughts on a classic rock band performing with the orchestra, it was decided the planning process should go forward. Knowing the concert/event would be an expensive endeavor, a partner, the Marshall Regional Arts Council (MRAC) was approached to combine forces and they agreed. Marshall Main Street Director Bo Ellis was approached, along with the City of Marshall, to determine the logistics and if the concert/event was possible. Luckily for everyone involved the answer was YES. Both boards along with Joyce Weekly, MRAC executive director; Bo Ellis, Main Street director; and Tiffany Ammerman, MSO president and serving as chair began in-depth planning. The process took over a year, and in September of 2007 the first downtown concert was performed - Jeans ‘n Classics with the Marshall Symphony Orchestra featuring the music of the Eagles. In the beginning, an entire city block was closed off and covered by an enormous tent. As the years have passed, an additional block was closed for overflow. The setting is the main street with the Harrison County Courthouse in the background. The tent is a must, due to the fact that the show must go on rain or shine! It takes the entire week to set up for this concert/event. 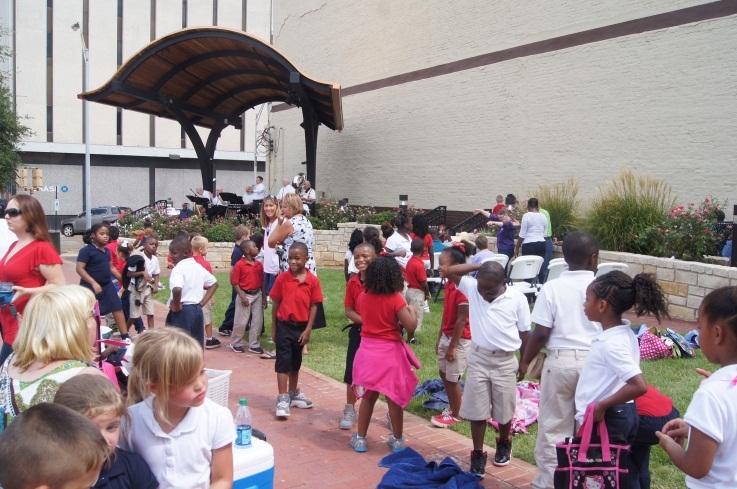 On Friday night the symphony holds a rehearsal downtown which is free to the public. The Marshall Symphony League has been in charge of the Gourmet Hot Dog Fundraiser that takes place during the Friday rehearsal. A local wine shop on the main street holds a wine tasting. Sponsors and individuals purchasing tables have access to their tables on Friday night and Saturday and of course, the tables are the premiere seating. Friday night festivities are almost as fun as Saturday! The Saturday morning free rehearsal is a good time for children to attend, as it provides an opportunity for them to converse with their favorite orchestra member. Everyone is encouraged to shop downtown and place their name in the hopper for a drawing to receive a free table at next year’s concert. On Saturday afternoon, there are several gates around the venue, and attendees are charged for admission. If you had previously purchased a table, local restaurants will serve you dinner before the concert at your table. Over the years, tweaks have been made. For example, last year we made the event an entire week with the Convention & Visitors’ Bureau scheduling entertainment beginning the Saturday before. The Marshall Symphony Events began on Wednesday with the annual Dixieland on the Square; on Thursday, Meet Your Orchestra featured one of the lead singers from Jeans ‘n Classics; Friday night rehearsal and festivities; Saturday morning rehearsal; and the Saturday finale concert on Saturday night. The 1000+ attendees look forward to the week-long celebration. The event is the largest concert MSO or MRAC holds and has been a successful collaboration with MRAC, Marshall Main Street, and the City of Marshall, not to mention the positive aspect of an increased audience. MSO and MRAC split the expenses and share the profits for this event. The downtown concert takes over 100 volunteers and would not be possible without every one of them!!! Volunteers, tell us your story! The Volunteer Council will celebrate 50 years of working with and honoring ALL volunteers. The League and the Volunteer Council recognize the value that each of you add to your orchestra. You are passionately dedicated to your orchestra’s success. You are energetic and diligently ensure that our orchestras thrive. We want to hear from you! As part of our anniversary celebration, please send us your stories. What extraordinary volunteer experience have you had? Have you had a humorous experience? How are volunteers valuable to your orchestra? In honor of this golden anniversary, the Volunteer Council is endeavoring to raise $50,000 or more as a gift to be presented to the League for basic operations in professional education and research for the field. Should you wish to honor your volunteers with a contribution, your gift may be sent to Helen Shaffer or Heather Moore c/o the League of American Orchestras, 33 West 60th Street, 5th Floor, New York, NY 10023 Attn: VC 50th Anniversary. All gifts at the Sustainer level ($1,000) or more will be acknowledged at the Conference in St Louis, and Sustainers will be invited to a special private dinner during Conference. We hope you will join us for the festivities in St. Louis, and contribute to the collective goal of honoring ourselves and the League!